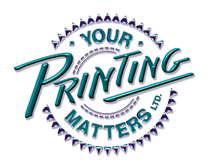 your printing matters Printing - High quality printing materials. Thank you for the fast turnaround in the designing of my new business logo and the printing of my business cards and invoices. They look great! Just wanted to let you know Purolator brought our scratch pads and envelopes this morning. I checked everything and it’s all perfect!!! "Thanks for the designing, printing and mailing of our UCF tax receipts. I am very pleased."